For nearly eight years, The Copper Onion has been redefining local cuisine, offering uncommon and approachable dishes that keep the place humming on the reg. If you’re in the loop (read: you follow them on social media), then you know once one of their seasonal dishes rears its head, it’s a signal fire to hustle in and eat it before it’s replaced with their next conception; But the true prize has been staring at you from their menu this whole time: The Copper Onion Burger. 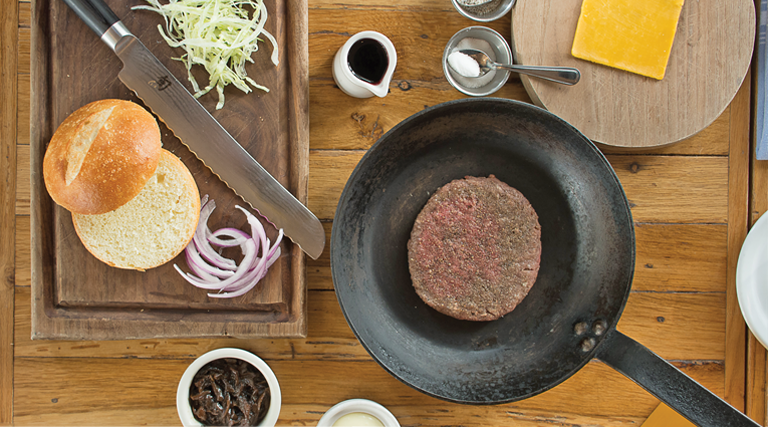 Created by owner/chef Ryan Lowder at the time of Copper Onion’s inception, The Copper Onion Burger has been the go-to for an untold number of regulars. Consistent, simple and uniquely balanced, this might well be the dragon their chefs are chasing with every menu change. 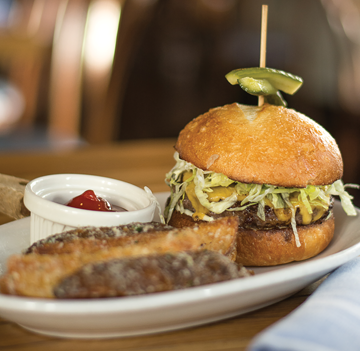 Built with Niman Ranch beef, rendered duck fat aioli, onions caramelized with wine and sugar, shredded iceberg lettuce and topped with a bun made in-house daily by Chef Manny, this bovine beauty is seared on a perfectly seasoned plancha and topped with an optional slice of Tillamook cheddar. Served with a skewer of housemade pickles and a side of steak fries or arugula salad.